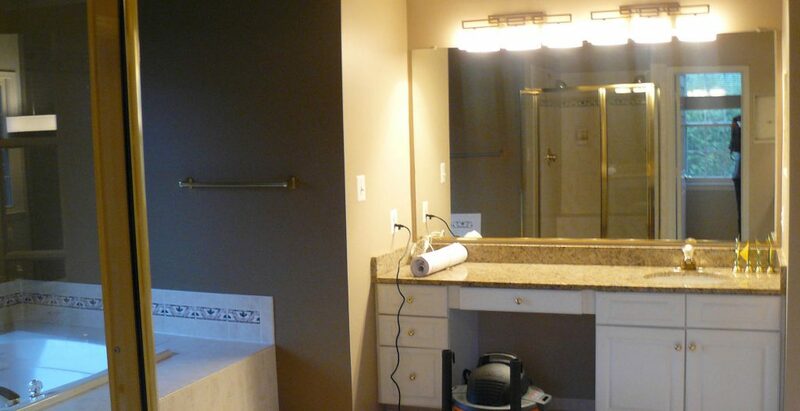 After many years with his late wife who specified interiors, this older gentleman decided to opt for a luxurious master suite update more suited to his individual tastes. 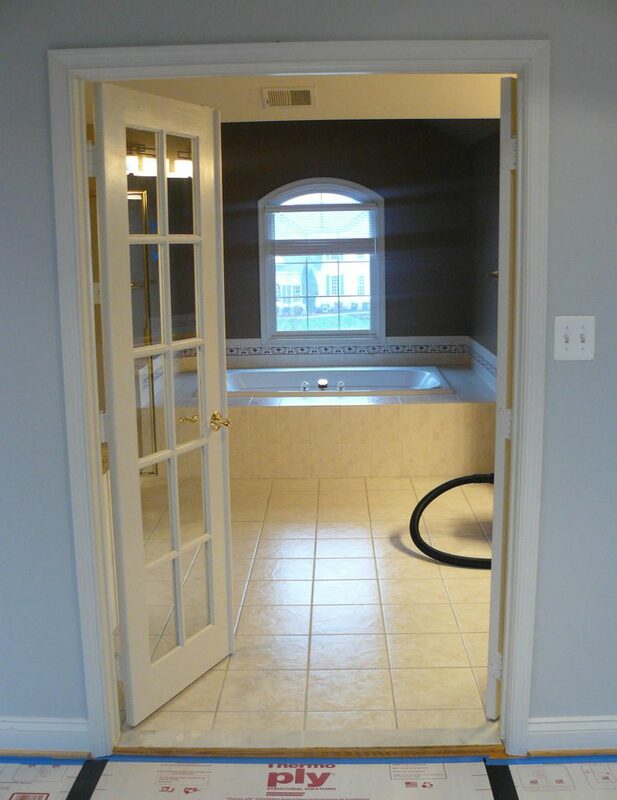 He wanted first to remove a little-used soaking tub to create a roomy second-floor bathroom. Mindful that he would be aging in the home, we set out to create a design that would be polished, functional, and fully accessible. The new master suite now creates an enticing and relaxing respite, yet a remarkably practical space for years to come. The plan was to alter the traditional street-facing window to stay true to the new modern design. But the neighborhood Homeowners Association didn’t allow any modifications to the front of the house. The solution: a thick pane of frosted glass with graphic clear banding. Just transparent enough to let sunlight in, the design element created privacy with no need to alter the exterior wall. 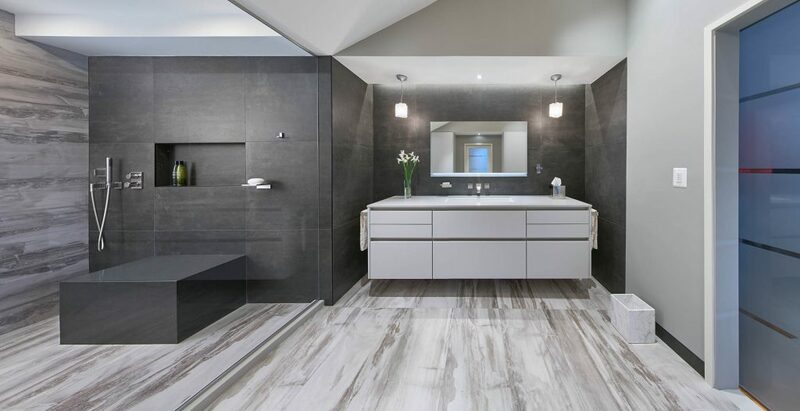 Contrasting large-format porcelain tiles—one pattern and one solid—combine masculine minimalism with an earthy, organic appeal. 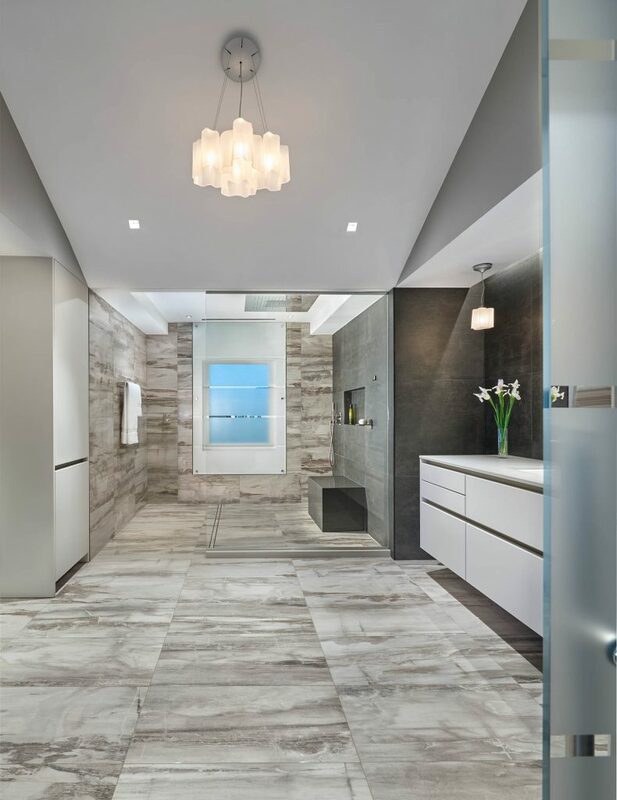 The result is a stunning modern bathroom, contemporary yet warm. 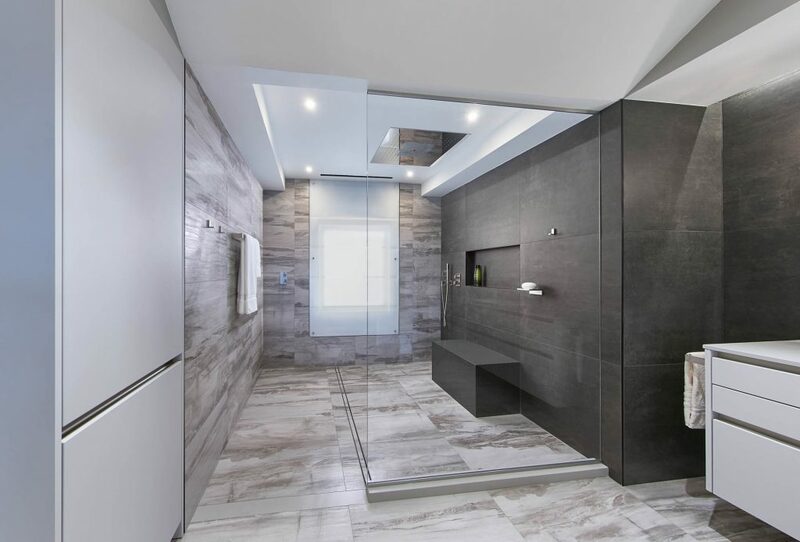 To provide barrier-free drainage that wouldn’t detract from the clean lines of this oversized walk-in shower, an extra-long custom linear drain was installed into the floor system. This intricate structure gently guides water downward, keeping the shower walkway clean and dry. 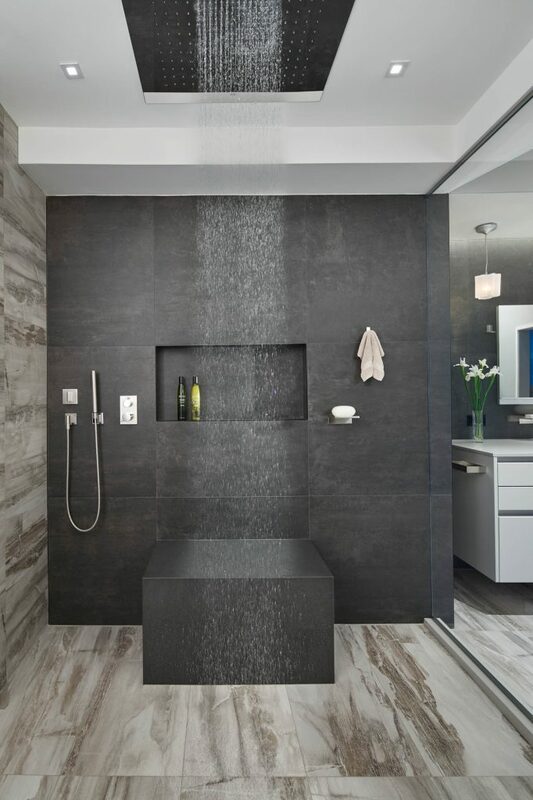 The sleek hand shower with thermostatic control valve guarantees an effective cleanse from any angle, while the massive multi-setting rain shower head promises a natural spa-like retreat. A recessed niche makes for convenient shelving and a custom bench provides a place to sit or rest when needed. 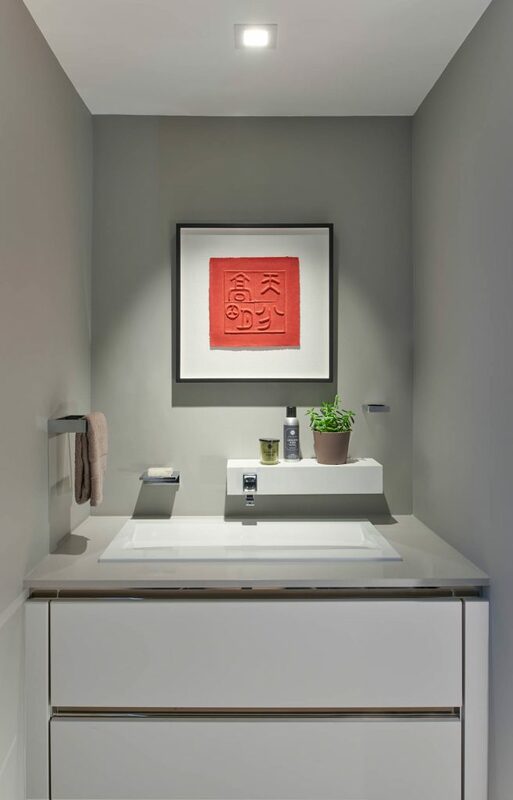 A floating vanity in warm gray and matte white lacquer keeps necessities within reach, yet easily tucked away with a light push. Its streamlined design and integrated handles harmonize perfectly with the square angles of the tiles and space. The existing ceiling provides an interesting angled contrast; hanging pendants and chandelier in hand-blown milky glass are as artistic as they are functional. 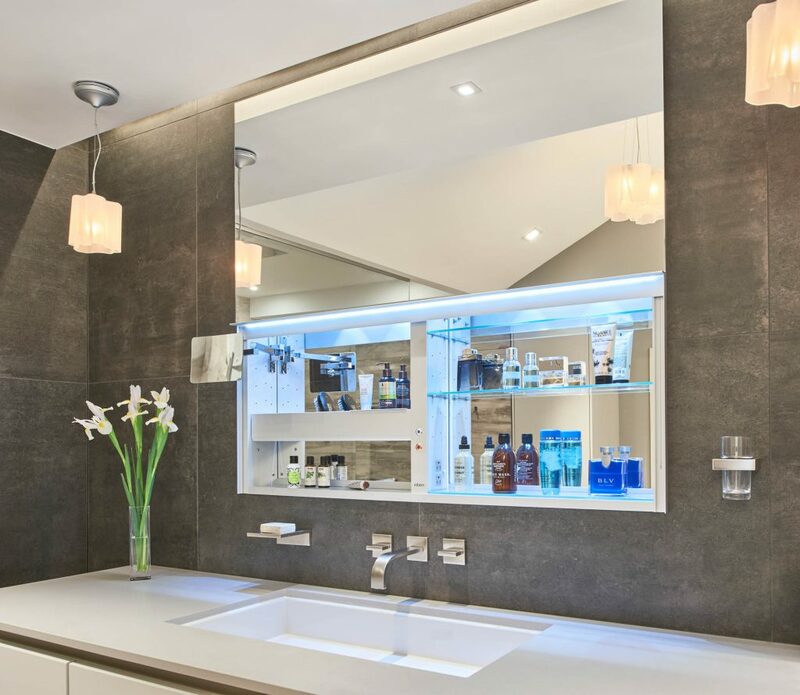 The ultra-sleek lift-up mirrored medicine cabinet is fit with fogless settings and additional LED lighting. Other features include a pullout magnifying mirror, internal heating and cooling controls for creams and balms, nightlight, and USB ports and outlets to power electronics in one convenient location. 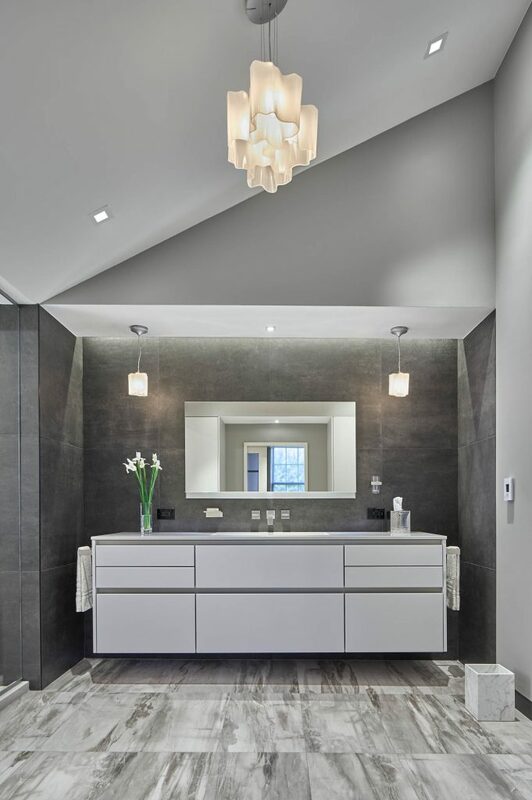 Tailoring the bathroom to the client’s individual needs and desires meant partitioning off the water closet to a detached room off the space and providing ample, practical storage. The self-cleaning toilet with integrated bidet includes a night light, built-in air deodorizing system, warm-air dryer, and more. A hovering faucet doubles as a small shelf as the flow of water gently streams into an elegant, sloped basin. Modern storage beneath looks stylish and keeps the necessities close at hand. The client requested an experience that would be sophisticated but extremely easy to manage. Instead of multiple dimmers and ventilation switches, a wireless program now puts all of these functions into one simple apparatus mounted on the far wall. The automated, fully-integrated system allows the client to use his cell phone or iPad to program the LED lighting for timed dimming and to control room temperature with the push of a button. 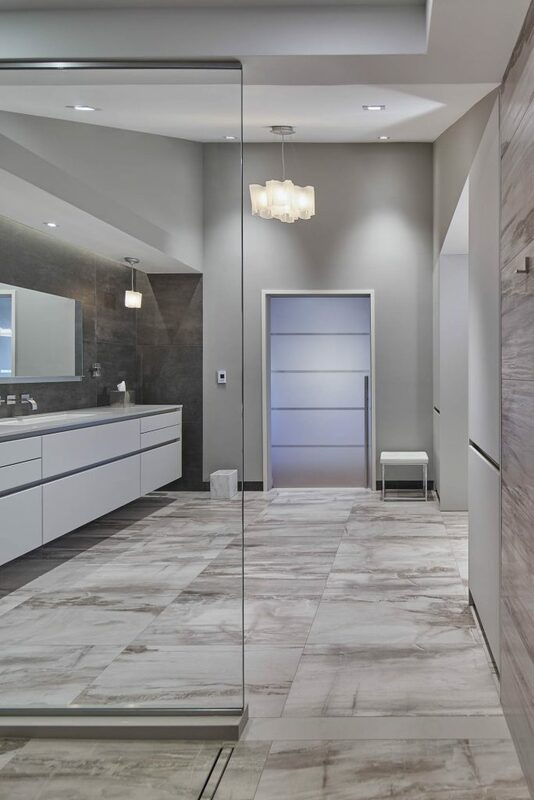 Wider doorways to the main entrance and water closet are now fit with custom sliding glass pocket doors and specialty European hardware, making them both accessible and beautiful. 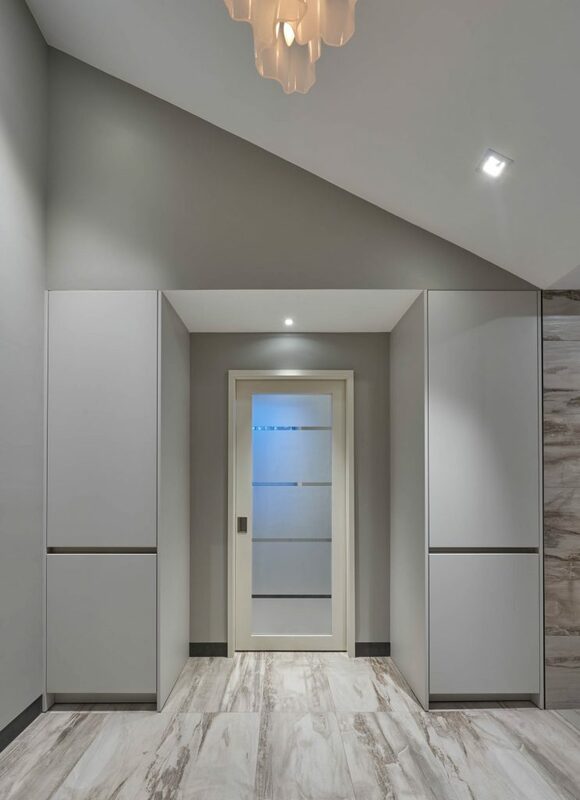 Knowing the homeowner wanted to age in this place, we added this stylish elevator to make the master suite fully accessible. A contemporary metal laminate creates a sophisticated, yet playful look. 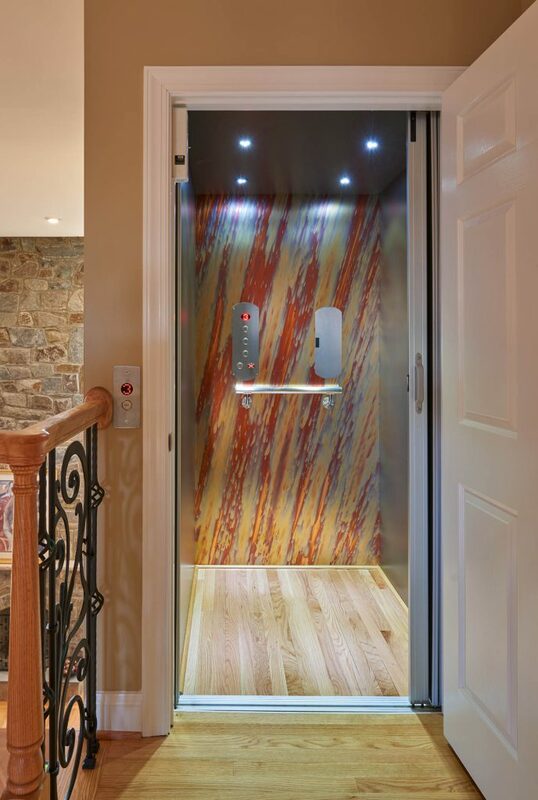 The polished digital display makes use of the elevator clear and uncomplicated. 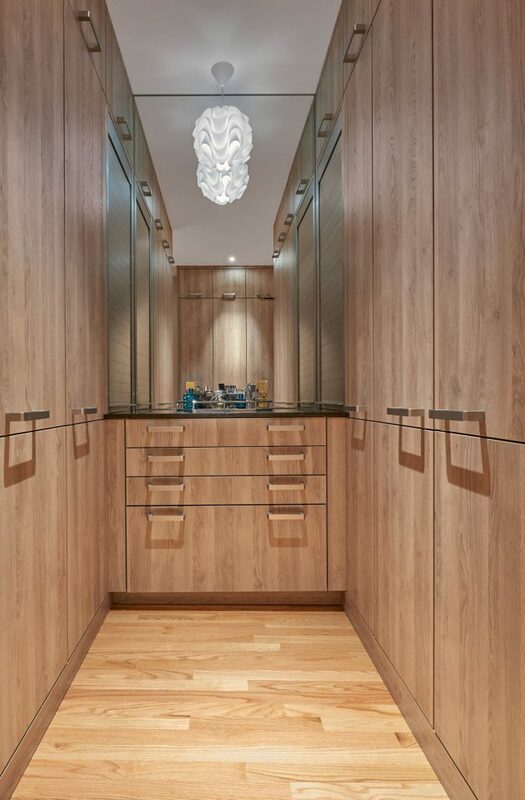 The client wished to combine the existing his and her walk-in closets into one refined dressing area— with certain items in plain view, and others tucked neatly out-of-sight. 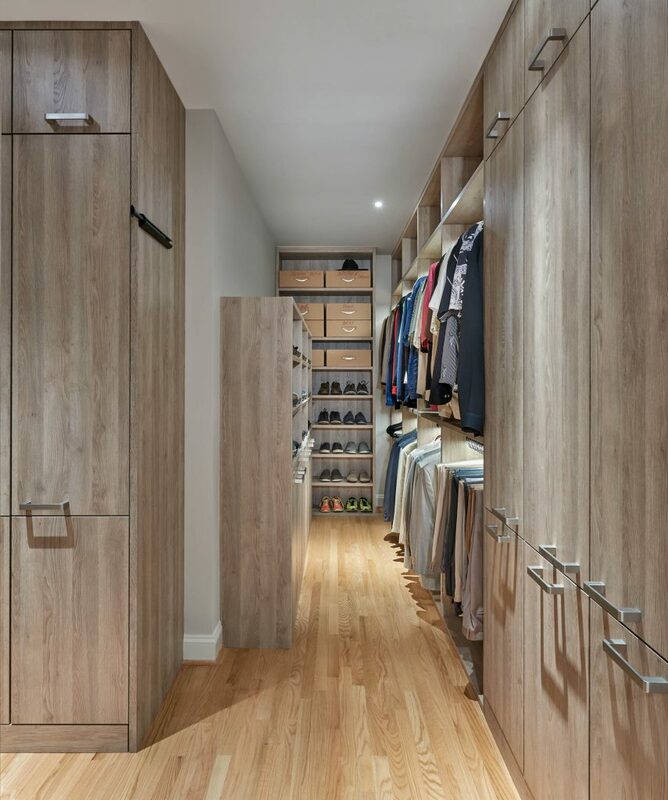 Modern cabinetry and shelving in gray-brown laminate provide ample storage for the gentlemen’s shoes and hats; lit closet rods illuminate the space for aging eyes, making choosing between shirts and slacks a breeze. 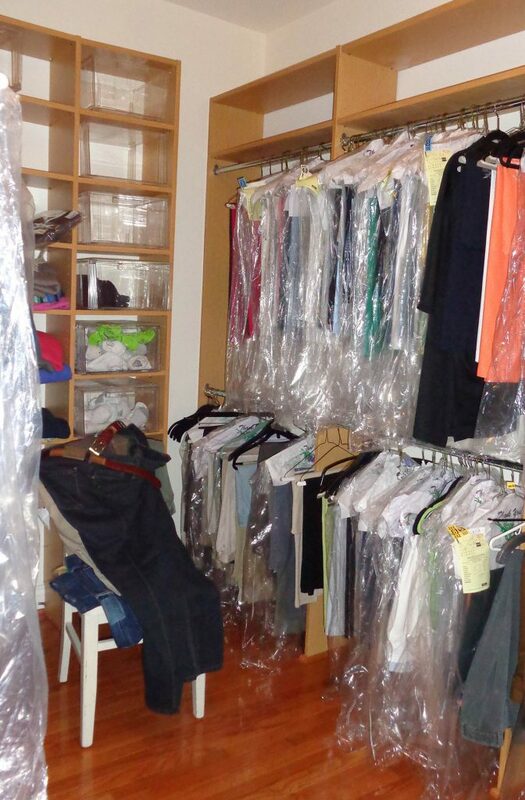 Three roll-out hampers keep the closet tidy and conveniently organized for laundering and dry cleaning. A rich chestnut quartz counter is the perfect place for the client’s cologne collection. On each side of the mirror, shelves are concealed with roll-up doors, housing watches and cufflinks safely under lock-and-key. Sleek drawers beneath keep socks and accessories easily within reach. A soft pendant light dangles delicately from above to create a soft glow and a touch of whimsy. Silk ties and braces drape easily on customized hooks for effortless selection. 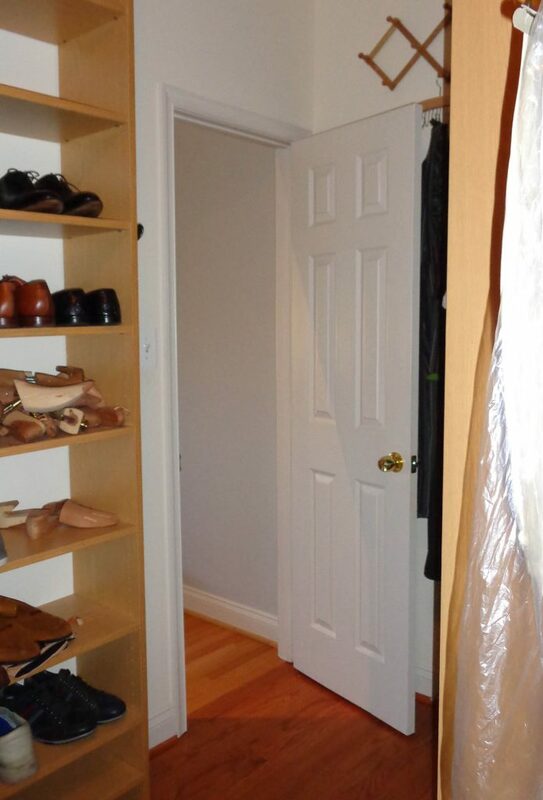 A jib door was fitted seamlessly to the closet’s entrance, camouflaging the dressing room completely from the outside. Featured in Home & Design, Spa Retreats, Sept/Oct 2017, Professional Remodeler, 2017 Design Awards, Sept 2017, and Home & Design, Spa Retreats, Fall 2017. Awarded the 2017 Professional Remodeler Design Award: Platinum Award for Bath over $60,000; 2017 Qualified Remodeler Master Design Award: Silver Award for Bath over $75,000; 2017 Remodeling Magazine Design Award: Platinum Award.